Children at Sheerness West Federation have a values based curriculum. We have 11 core values that we believe in and celebrate. These values were picked in consultation with children, staff and parents. 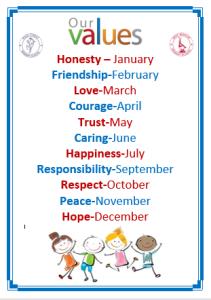 Each month there is a different value for the children to celebrate. Come and look around the school and find out about our value this month. Here at Rose Street Primary School our vision and values are at the core of everything we do. They underpin our teaching and learning, and provide an environment which prepares our pupils as confident, happy citizens.